“[No heading].” Weekly Times (Vic. : 1914 – 1918) 14 Aug 1915: 28. Web. <http://nla.gov.au/nla.news-page13609677&gt;. Born in 1894 at Hamilton to James Alexander Morison and Essie McKellar, John Archibald McFarlane Morison, better known as Jack, attended the Hamilton State School. After finishing school, Jack was apprenticed to Cornell & Naylor, carpenters of Hamilton. The family lived in North Hamilton and father James was a carrier, but sometime after 1912, the Morisons moved to Maroona were father James operated a shop. Jack went to work for Mr Gilmour a carpenter from Willaura. He was also a good player for the Maroona and Willaura Football Clubs and secretary of the Maroona Football Club. Prior to enlisting, he was working as foreman carpenter with the railways on the new Maroona-Geringhap line. 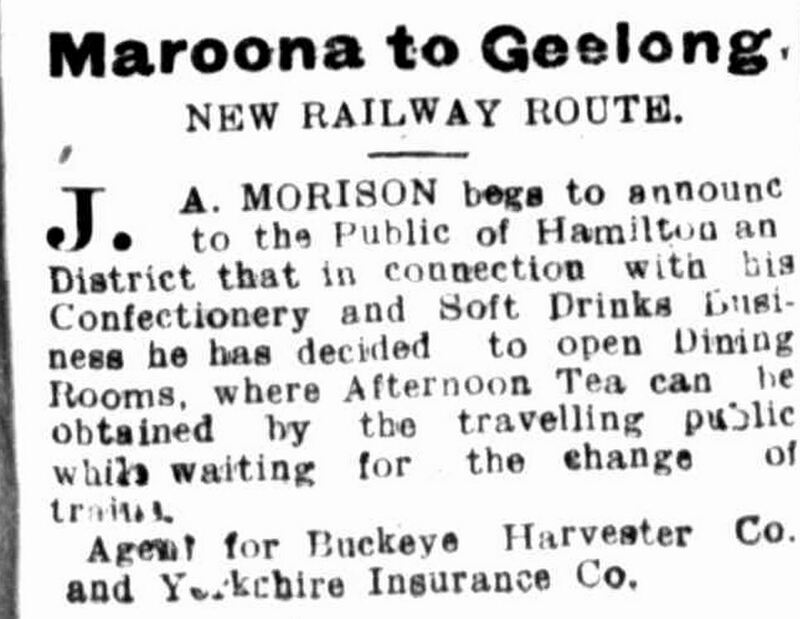 James Morison opened dining rooms to compliment his shop, taking advantage of the opening of the new rail line. ” Hamilton Spectator (Vic. : 1870 – 1873; 1914 – 1918) 10 Jan 1914: 3. Web. 24 Jun 2015 <http://nla.gov.au/nla.news-page13376008&gt;. Just months after WW1 broke, Jack left Maroona and enlisted on 17 October 1914 at Broadmeadows, joining the 8th Battalion, E Company. His brother James, better known as “Dinnie”, had enlisted in August and was also with the 8th Battalion. Jack sailed for Egypt just two days after enlisting, on 19 October 1914, leaving no time to travel home to Maroona for goodbyes. He did, however, have “Dinnie” and he would reunite with some of his Hamilton mates. The 8th Battalion was part of the second wave of troops that landed at Gallipoli. Around 5 May, the 8th Battalion moved to Cape Helles with a plan to take the village of Krithia. The attack started on 8 May, but it proved costly to the allies and the village remained in enemy hands. A letter home written by Thomas Skeyhill of Hamilton and published in the Hamilton Spectator on 26 October 1915, gives a good account of the events of 8 May at Cape Helles which was the turning point in not only his war experience, but also Jack Morison’s. With them in the trenches were “Dinnie” Morison, Gordon Torbet and Gus Lodge of Hamilton. 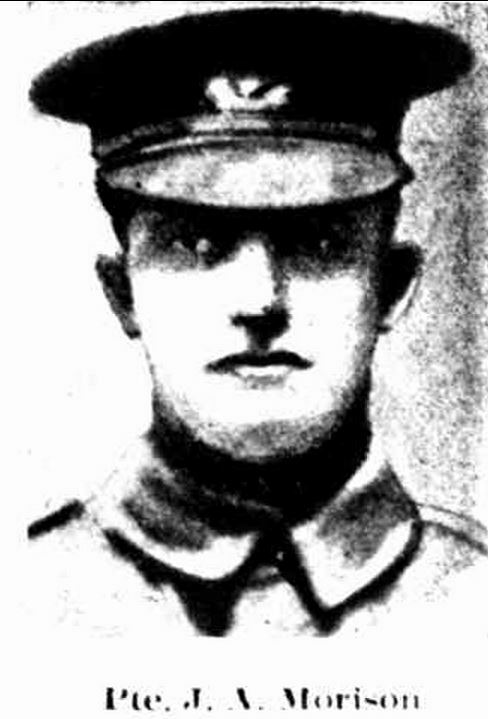 On 1 June, the Ararat Chronicle and Willaura and Lake Bolac Districts Recorder reported James Morison had received news that Jack was wounded but was progressing. On 8 June, the Hamilton Spectator reported that James had heard the day earlier that John was out of danger. But as “Dinnie” Morison and Tom Skeyhill speculated, his condition must have deteriorated quickly with Jack dying of his wounds on 12 June in Malta. The Ararat Chronicle and Willaura and Lake Bolac Districts Recorder reported the sad news on 18 June. In early April 1917, Thomas Skeyhill spoke at the Rossbridge Hall near Maroona. Tickets were available for purchase at James Morison’s shop. John “Jack” Morison was remembered with a tree planted along Hamilton’s Anzac Avenue.